What is the FUNgasa Product Review Panel? 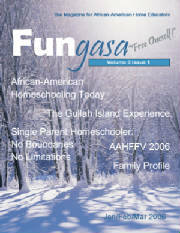 The FUNgasa Product Review Panel is made up of real families -- moms, dads, children and grandparents -- who test products, read books, listen to music, watch DVDs, and review curricula. If you enjoy learning about new books and products, especially those of Black or Family-Owned Businesses, and can write a brief review, please consider joining the FUNgasa Product Review Panel. It’s simple, quick & free! Complete the brief application and as products in your area(s) of interest come in, we will contact you!